Storage tips to banish kitchen clutter!! For most of us, kitchen storage starts with a home for the basics: cutlery, pans, plates and mugs. Then there are the blenders, bread makers and myriad bakeware that need to be stowed, plus the usual packets, bottles and cans. And we all have different storage preferences – some of us won’t mind standing on a stool to reach a high cupboard, or stooping for a bowl. And, while there are those among us who love to display kitchenalia, others prefer everything out of sight. There really is no one size fits all when it comes to kitchen storage, but, with a little planning, you can find the perfect solution to suit you and your space. Browse these ideas for keeping your cooking clutter under control. Try changing your mindset when planning and designing the inside of your cupboards: don’t necessarily think of doors and drawers as simply having to conceal a multitude of sins. If units look good with the doors open as well as shut, then chances are you’re already halfway to having a more organised kitchen that’s a pleasure to use. Designers are cottoning on to the fact that the insides of our cupboards should also look attractive, as seen in the beautifully finished Plain English cupboard, pictured above, with its attractive brackets, rather than being dull, empty shells. Remember, too, it isn’t only shelves that can live behind cupboard doors. Here, cutlery drawers and racks are also tucked away, as well as a crafty extra slab of worktop for slicing bread. 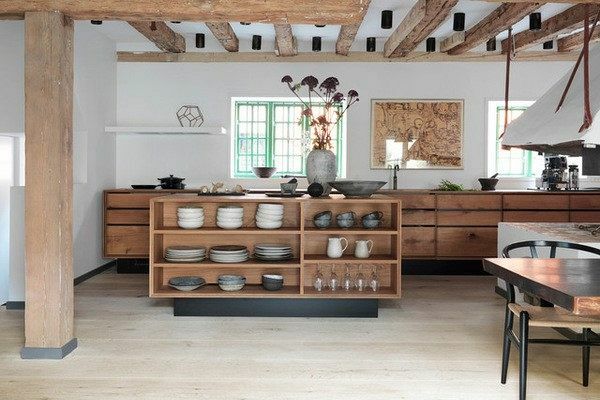 An island with open shelving can be a way to bridge the gap between the functional and the stylish in an open-plan kitchen-diner, as this unit demonstrates beautifully. Here, carefully stacked matching crockery adds character, but this arrangement is also practical – you can grab plates and glasses and lay the table in your dining area in a jiffy. Remember that coordinated crockery is definitely the trick for a streamlined look. Are your ceilings extra high? Do your cabinets reach right up to them? If not, then you could be missing out on potential storage space. In a lofty room, an extra bank of cabinets can be built to make the most of available space, in conjunction with a ladder that slides along on a rail so that the top shelves can be reached. Bespoke cabinets, if you can afford them, may make more sense than off-the-peg numbers in unusual-shaped spaces. When planning cupboards, drawers and shelves, ask yourself the most crucial question: what will I actually be using them for? For many of us, kitchen storage isn’t just about plates, pans, mugs and cutlery, it’s about those other trickier items, such as the iron, vacuum cleaner and chunky blender. A bespoke cupboard may be the answer. Don’t assume you have to go for conventional timber or laminated shelving. This cupboard is full of neat, utilitarian pull-out wire racks that keep packets, jars and other groceries in order. There are lots of different options for similar wire mechanisms that fit standard-width cupboards and drawers, so investigate which options work for you. In general, when planning storage, work out how much space you’ll need for food, crockery, cutlery, saucepans and so on – also think about the number of people in your home. You may need more space than you think, especially if your family is growing. Open-plan shelving can be practical as well as good-looking: the key is not to overcrowd it, which means being ruthless about binning or giving away those unloved glasses and plates. Open shelving does require discipline, so be honest with yourself before committing: how tidy are you and will they remain looking stylish and dust-free? Don’t just consider the larger items when planning storage, but remember the minutiae of small packets and bottles and how the insides of your cupboards and drawers are organised. Here, pull-out shelves in a pantry mean you can always see what’s hiding at the back. Many problems we associate with chaotic kitchen storage come down to the wasteland that is the backs of cupboards, or overstuffed drawers not being accessible enough or easy to clean. It’s easy to see why drawers are a popular choice in many kitchens. They’re ergonomic to use and can look more modern.Sticking to drawers and ditching wall cabinets entirely – assuming you can incorporate enough storage this way – can also help a kitchen feel less cramped and more spacious. Deep drawers can be used to house items such as pans and plates, reducing the need for wall cabinets: just make sure you measure up first. Go for slimmer drawers at the top of units for cutlery and utensils, and deeper ones at the bottom for pans and plates. (Search for special kitchen drawer dividers to make life even easier.) Make sure drawers feature good-quality soft-close mechanisms and runners that won’t stick or trap little fingers. But remember, if you do decide to lose all your cabinets above the worktops, consider how you’ll feel about having to bend down to access absolutely everything. The key to kitchen storage is having a designated home for everything, from your cereal to your herbs and spices. This stunning, luxurious walnut pantry features the ultimate spice rack built into the doors: no more rummaging around for cinnamon or chilli powder in dark, sticky corners. It also demonstrates how it isn’t only fridges that can sport racks built into the doors. Making the most of every inch in your kitchen is crucial for many of us, especially when space is tight. Corner drawers, or cabinets featuring special pull-out, pivoting mechanisms (that ‘curve’ around a corner), can be great ways to maximise your storage potential in compact kitchens and awkward spaces. If you have a cat or dog, then chances are they spend quite a lot of time in your kitchen. While you’re hardly going to require ‘storage’ for your pet, building in a bespoke special doggy chill-out zone could well be worth considering if it frees up space elsewhere. A traditional tall cupboard with glass doors can work wonders in the kitchen, if space allows. The glass gives some of the benefits of open shelves (a sense of space and opportunity to display your favourite crockery), but the cupboard’s height and width means it can also hold a surprising amount of stuff. It will also offer a country-style contrast to a run of identikit units. It’s worth reminding yourself, storage isn’t everything. It might seem tempting to fill every spare centimetre of your kitchen with cupboards and drawers, but that could, ironically, leave your pad feeling more cramped. Instead, build in some breathing space to keep things stylish.